Pictured are: (Back Row, left to right) David Barnes, W.H. Mason, Clark Farley, D.T. Ferrell, Jr., Dr. N.B. Cuff; (Second Row): Rozellen Griggs, Imogene Wells, Christine Hertlein Barnes, Martha Sallee Adams, Mae Faubash O'Donnell, Beulah Correll Farley; (Front Row): Frances Elkin Nickell, Alma McLain, Roberta Stevenson Hobson, Betty Griffith Hudson, Denver Sams. 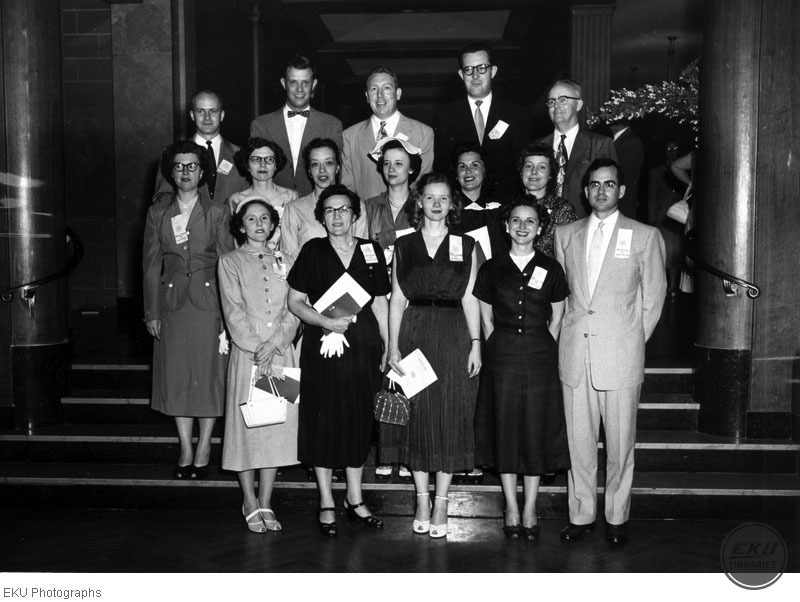 Unknown, “Alumni Group,” Digital Collections, accessed April 25, 2019, https://digitalcollections.eku.edu/items/show/30348.